USIT rings are used for industrial applications in which high seal tightness is required, high pressure predominates and a secure sealing effect must be guaranteed, for example, in the processing, food or pharmaceutical industries. 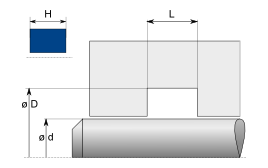 The USIT rings of Freudenberg Sealing Technologies are metallic flat seals with an internally or externally vulcanised, trapezoidal, rubber-elastic sealing bead for the static sealing of screw and flange connections. The sealing bead guarantees a safe, self-reinforcing sealing effect.